UEFA Nations League. That’s the competition none of us cared about right? That was until Jesse Lingard and Harry Kane’s late antics against Croatia put us into the semi-finals next summer. Now, there’s talk of us winning a major (and I use the term loosely) trophy for the first time since 1966. Earlier this week Gareth Southgate’s World Cup semi-finalists were drawn against Ronald Koeman’s Netherlands and the two former heavyweights of European football will do battle in Portugal next June. Through the years there have been some classic battles between the sides, with the Marco van Basten-inspired Dutch winning the European Championships in 1988, having beaten England 3-1 in the group stages. But we’re going to delve into the 1996 championship on English soil. 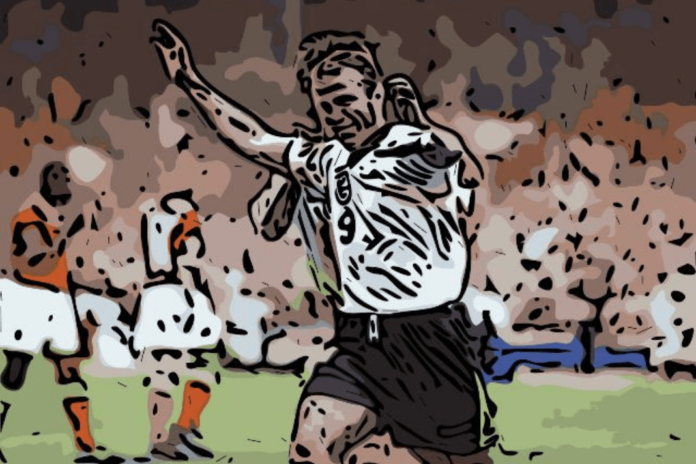 Terry Venables’ Three Lions went into the final Group A match against Holland off the back of a 1-1 draw with Switzerland and a 2-0 victory against the Auld Enemy, Scotland. For Guus Hiddink’s men, a 0-0 draw with Scotland was followed up with a 2-0 win against the Swiss. June 18, 1996. The winner takes it all – the group, and theoretically, an easier passage to the latter stages. A draw would send both sides through to the quarter-finals but a defeat for either side could open the door for Scotland or Switzerland to qualify. England’s last triumph against the Netherlands had been a 2-0 friendly win some 14 years earlier. It wasn’t going to be easy but a cacophony of noise enveloped Wembley as the game got underway. The tune – Baddiel and Skinner’s Football’s Coming Home. By the end of the match, everyone believed. Stuart Pearce came into the England line up for an injured Jamie Redknapp as Venables reverted to a 4-4-2 formation. Paul Gascoigne and Paul Ince played the central midfield roles with Darren Anderton and Steve McManaman on the wings. Teddy Sheringham and Alan Shearer led the line. For the Dutch, a 4-3-3 attacking formation was switched to a 3-4-3 diamond as Jordi Cruyff joined Clarence Seedorf, Aron Winters and Richard Witschge in midfield. Dennis Bergkamp, Ronald de Boer, and Peter Hoekstra made up the front three. In a tight affair, it was England who took the lead when Paul Ince was tripped by Danny Blind in the 23rd minute as he latched on to a McManaman pass just inside the box. Shearer, who finished the Premiership season as top scorer with 31 goals, stepped up to score his third of the tournament. 1-0. Advantage England. The Dutch didn’t lie down though. With the dazzling footwork of Cruyff and Seedorf, Hiddink’s men looked the more likely to get the second goal. Winters headed a corner over David Seaman’s bar and Bergkamp shot narrowly wide from 18 yards as the pressure built. Bergkamp was unable to head home a Michael Reiziger cross on 40 minutes and England had Seaman to thank for tipping the ball behind for a corner when his Arsenal teammate latched on to a defensive error from Southgate and looked poised to level the match. Sheringham and Ince – who would miss the next match – picked up yellow cards as England survived the onslaught and went into the break with a 1-0 lead. Hiddink replaced Witschge with Johan de Kock at the interval but it was Venables’ men who had the bit between their teeth. And in a 15-minute spell, what had been a cagey affair became a walk in the park as England put the game to bed, Sheringham and Shearer getting the party started. McManaman made yet another of his mazy runs into the box and forced a corner in the 50th minute and it was left for Sheringham to head home Gascoigne’s inswinger. 2-0 England. The hosts were heading into the quarter-finals and a clash against Spain. A chorus of ‘We love you England, we do’ rang out from the stands and five minutes later it was 3-0. Collecting the ball on the edge of the box from McManaman, Gascoigne danced past two defenders. He laid the ball off for Sheringham, who unselfishly, laid it on for Shearer. Bish. Bash. Bosh. Back of the net. Ecstasy for the England fans. A nightmare for the Dutch. The nightmare turned to utter despair for Hiddink as Edwin van der Sar was only able to parry a Darren Anderton strike from distance five minutes later. The ball fell to the incoming Sheringham who reacted quickest to slot home and make it 4-0. With half an hour to go, England relaxed. Their passage into the knockout stages secured. Venables rung the changes as David Platt, Nicky Barmby and Robbie Fowler joined the action but the game was won. Patrick Kluivert and Phillip Cocu came on for the Dutch as they looked to stay in the competition. A heavy defeat for them, coupled with a comfortable Scotland victory would see Hiddink’s men go home. And in the 78th minute, they got an all-important consolation when Kluivert latched onto a deft flick from Bergkamp to slot home under Seaman. At 4-1, the Dutch had hope. With Fowler heading wide and passes going astray on both sides, the game petered out to a 4-1 conclusion. But with Scotland only managing a 1-0 win against the Swiss, Holland scraped through on goals scored. 30 years of hurt were ready to be expelled. England were into the quarter-finals and football definitely was coming home. That was until Gareth Southgate agonisingly missed his penalty in that shootout with Germany. Fast forward 22 years though and it is Southgate who leads the new dawn. Penalty woes extinguished in the summer, his young squad is riding on the crest of a wave. That 4-1 victory was the last time England defeated the Netherlands – until Lingard scored in a 1-0 friendly win in Amsterdam in March. The tide is turning. Fans were left bitterly disappointed in Russia but now, anticipation builds for a strong 2019 and a potential trophy. Portugal and Switzerland contest the other semi-final. But let’s learn from our mistakes. Take it one game at a time. Koeman’s Flying Dutchman are running like clockwork and they qualified for the Nations League semi-finals by overcoming France and Germany. Yes. France and Germany. There are no done deals or easy ties in world football. June 6th is sure to provide fireworks.